More than 100 protesters gathered in Senate offices to protest GOP-led health care plan | Circa News - Learn. Think. Do. WATCH | Protesters gathered outside senators' offices on Wednesday to lobby against the GOP's health care plan to repeal and replace ObamaCare. More than 100 protesters from across the country staged sit-ins and demonstrations in a handful of Senate offices to vocalize their disproval of the Republican health care plan, affiliate WJLA reported. Capitol Police confirmed the arrests of 40 people "who refused to cease and desist" and were charged with "Crowding, Obstructing, or Incommoding." Protesters targeted the offices of Sens. Pat Toomy (R-Penn), Marco Rubio (R-Fla.), Rob Portman (R-Ohio), Tom Cotton (R-Ark. ), Cory Gardner (R-Col.) and Lisa Murkowski (R-Alaska). More than 150 people lined the halls, chanting their opposition of the bill. Phrases such as "Kill the bill, don't kill me!" reverberated throughout the hallway near Toomey's office. Many were restrained with zip-ties. The handful of protesters were constituents who traveled to the Nation's Capitol to speak directly with their senator. "We need proper representation, but we're not getting it," one protester from Lower Paxton Township, Penn., explained. Other protesters gathered outside Rubio's office, shouting "over 3.5 million Floridians rely on Medicaid for their health insurance," and "health care is a human right." They also boasted signs that read, "Don't take over health care," and "TrumpCare = Death." The protesters, however, didn't limit their criticism to the hallways of Capitol Hill. 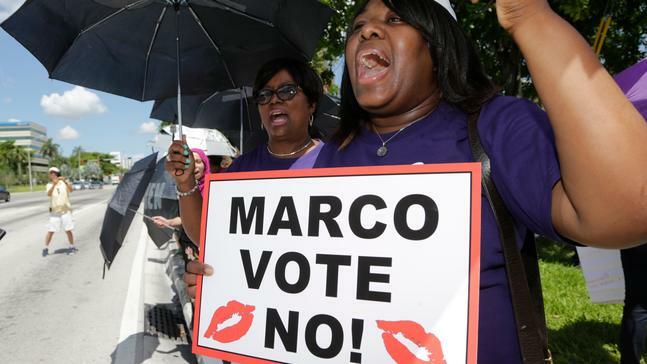 Constituents in Miami gathered outside of Rubio's state office as well. 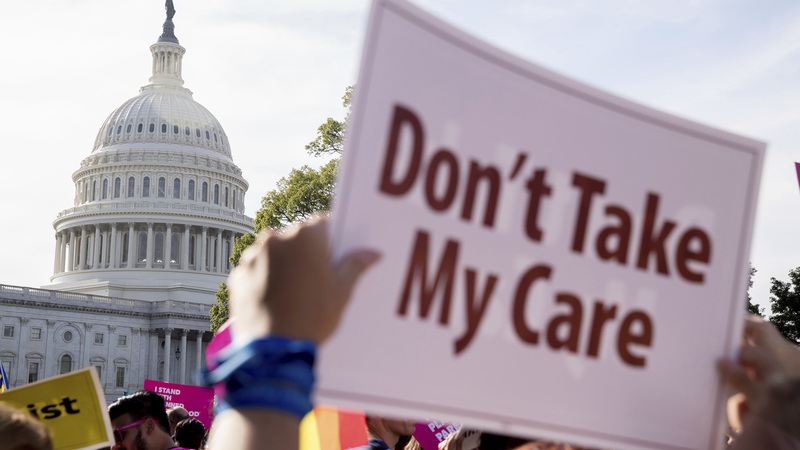 The flurry of resistance on Capitol Hill occurred one day after Majority Leader Mitch McConnell (R-Ky.) announced his party's decision to delay the Senate vote on health care until after the July 4th recess due to the lack of party support. At least nine GOP members vocalized their opposition to the legislation since it was introduced early last week. Even more "mainstream" Republicans, such as Ohio. Gov. John Kaisch, blasted the party for proposing a bill that would leave more than 22 million Americans to lose their coverage and lead to a $772 billion cut in Medicaid. In order for the GOP's health care legislation to reach the president's desk, Republicans can only afford to lose the votes of two party members. "Several of them want more time," McConnell said on Tuesday. "We have a number of different discussions going on, that have been going on for six weeks. They continue."